Commandos: A (Barely Now) Viable Troop? After it's recent buff and invincibility to traps, is it worth to research and use in battle now? If so, how reliable is it and wich nations work the best with it? i have mine fully researched with artifacts boosting life 15%. i think they're great; i usually take one into every multiplayer fight. you have to use them intelligently, but if you do they strongly contribute. one thing unique to them is that they will be more or less useful based on the defense strategy. 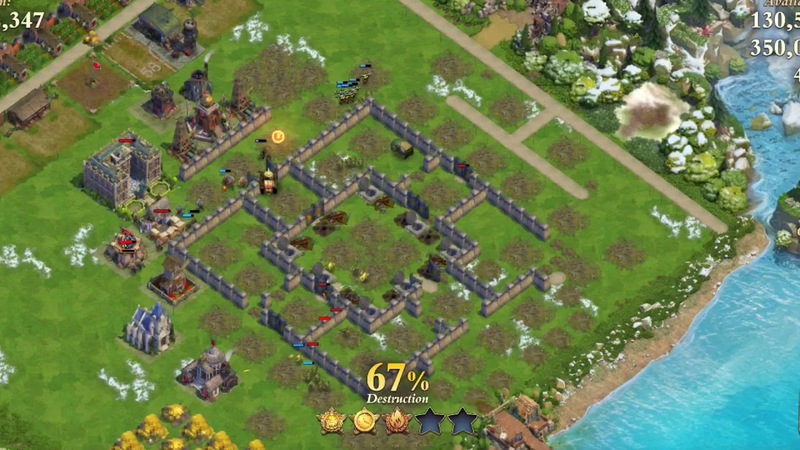 if a person lines up their towers, then the commando will destroy them all. in other bases, 2 bazookas would be more useful. they are more effective if you can provide air support to them. i dont provide them air support. i use them to support the air force. While experimenting with troop compositions for various nations I tried a commando-focused one. The idea was to drop a number of commandos and then use every force possible to protect the heck out of them from defenders. Had it worked it would have been a possible choice for shooter nations and a good way to attack complex bases. While not a total failure (a successful battle is shown below), what killed it in the end was the unit’s dreadful pathfinding. Bear in mind that the entire rest of the army was dedicated to supporting the commandos (with some bazookas added to handle economic buildings). The last thing I needed was for commandos to take a path that would lead them far away from the rest of the troops. But that is exactly what happened. In an extreme case, the commandos chose a path around the perimeter of the base to reach the next-closest defensive building. That wasted a considerable amount of time while putting the remainder of the army at risk since defenses were not being taken down. I would have had to rally on walls to open gaps in order to work around the pathfinding issues; at that point I said “enough”. A better use of commandos might be to support heavy tanks. A heavy tank attack with support units generally has two phases: in the first phase, the support units (such as armored cars and bazookas) help heavy tanks quickly get over the hump while winning the QV. In the second phase, the support units are usually dead while the heavy tanks finish the job. 2-3 commandos would die but still fit within the parameters of that attack type. Finally, there is tactical use of 1-2 commandos. I can’t say I’m a fan of that style because I expect my armies to perform in a more regular fashion. But that doesn’t mean that it can’t be used to good effect. An army of commandos? You feelin’ lucky, punk? I personally use 1 commando every battle. Especially with sabotage and or the blessing from the wonder to stop stables and garrison. Sometimes you get a trap immediately and he dies, but most of the time it is able to crash down 5 to 6 defense buildings.. I use two (well Saboteur, not upgraded to Commando yet as armoury maxed out on other troop upgrades) - and agree it depends on the base. I have found the most effective way is if they stay with the rest of your troops; eg other troops are fighting/distracting/healing and they are blowing stuff up rather than deploying them ahead.. Trouble is it doesn't always work like that due to the AI being daft, but when it does it's pretty unstoppable. Also issues if you have a couple close together they will follow to the same targets rather than different ones, which is annoying and a time waster. 5ht 4 infiltrators and 3 infantry ,is a good combo.agree base must be checked out for there poor pathing .but they also good wall breakers if the gate is far from drop sites .u must give them air support if u want them to last.yes they also are good for taking out air def .for brit style players u can also drop a few and rally to silo then use troops combo as pre silo times . they a bit slow tho. good as wall breakers for pesky rose bases 2 maxed will break cwa wall in 2 hits .and start working on def behind wall.use blitz or sabo to slow spawn of defenders .or just use them as expendables . Last edited by Excalibur; 01-16-2019, 07:07 AM. My base (268, CWA), is now regularly attacked by players only using Infiltrators, plus tactics and aircraft. Virtually nothing stops them, making the game idiotic. i'm trying using 3 infiltrators now, and it's surprisingly effective. 12 french tanks, 3 infiltrators, 2 rpgs, 2 infantry, armored car. kills most atomic and easy cwa bases. i've come to enjoy them..... but it looks like we have to retire them till the next update if they are irreparably bugged. Last edited by shukra; 01-24-2019, 04:17 AM. The commandos are working again, I have been using 13 of them to clear defenses and 6-7 bazookas to clear the rss and misc buildings. Surprisingly effective, and I can't wait until I have 5 planes to support my commandos, should be pretty deadly! Update: I now use 6 planes, 6 heroic commandos, and 4 heavy tanks Mk6. I can usually 5* level 220 bases with losing only 1-2 commandos, no TT, and no War Tactics. Last edited by NateTheGreat; 04-16-2019, 07:55 AM. My base (full def 284 lvl) is a complex design with open walls (and traps in the holes) to distract troops and.. someone just got 5* with commandos (I had 3O coalitions on). The attacker nearly ran out of time but managed the 5* by deploying commandos near all my troops-spawning buildings.. I'll be forced to change to avoid commandos based attacks. Were they maxed out infiltrators? yes Nate. What I do not know is their stats from museum. I guess that to use them properly in war you need to increase their pv. The only but is that I had no defensive coalitions. Is a but in brackets because I have a 25% buff of defensive towers with the museum. Ah.. and my stronghold was empty..